In my earlier post, I talked about the many factors that make fractions challenging for students. If you missed it, you can read it by clicking RIGHT HERE. 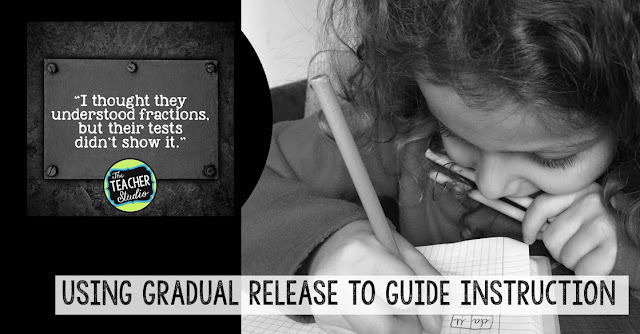 Before my next few posts where I tackle some “in the trenches” ideas about fractions, I want to talk about gradual release, an instructional strategy that is true in good math instruction across ALL topics. What is “Gradual Release” of Instruction? Now, I’m not going to lie. I feel this is a very over-simplified model of what a true gradual release of instruction plan should involve. A true gradual release is NOT linear; it is recursive and cycles around and around as we layer our instruction. That’s for another day! But what I see happening oftentimes is that we teach, we practice, and then we assess–and the results of the assessment don’t always make us so happy. I’m going to propose a SECOND type of gradual release that is particularly pertinent in math instruction. It looks a little something like this. Now, what this arrow represents is that when we introduce a concept like fractions, it is absolutely critical that we provide our students with the opportunity to spend time–lots of time–in the world of the concrete. Whether this means paper folding, using pre-made fraction manipulatives, base ten blocks, actual pans of brownies, paper pizzas–WHATEVER–we must immerse students in experiences where they see, feel, and move objects to make discoveries. 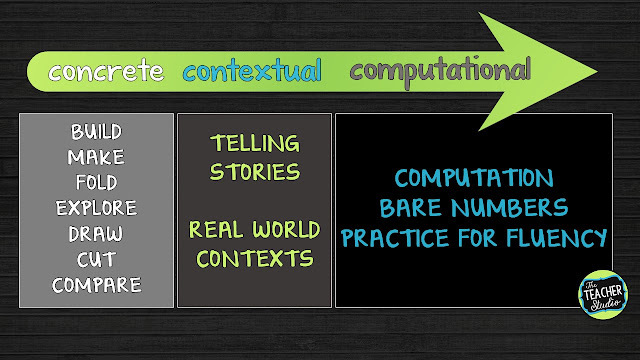 As we do this, it is important that we help students start to make connections between these “objects” and the real world. This is where stories, real-world examples, and meaningful problem solving come in to play. A student with very little fractional understanding or experience can perhaps start to make connections when we present a problem like this. The problem we have shared is essentially this: “What is 1/4 of 24?”, a problem that surfaces in most fraction units later on…and usually with a page full of similar problems. 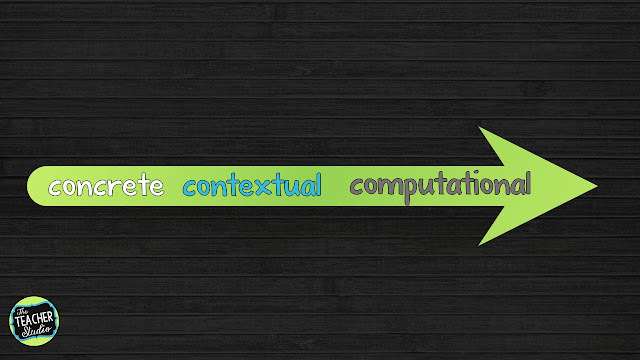 By telling the story in context, helping students visualize (“Can you imagine what that tray of cookies might look like?”), perhaps even sketch or model it–this more advanced skill is very accessible to even the most beginning student. 3/4 + 4/4 = ? 5 x 3/8 = ? Generate a list of 3 fractions equivalent to 4/5. These are all the types of questions that we find rampant in our textbooks and teaching resources–and they DO have value. The question is WHEN. WHEN does it make sense to do these? 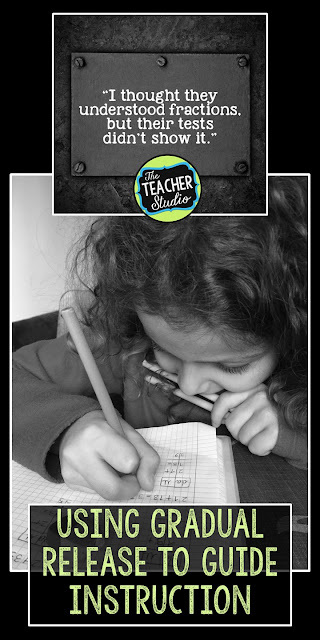 In my view, the correct timing is when the understanding is there and students need simply to work on the fluency and accuracy of the tasks. Students do not learn best by doing tasks like this; they learn to get more fluent and adept at tasks like this if the foundations have been clearly set. One thing I have found–especially for the more beginning levels of fractions, is that students may seem to be understanding. They fill in the answers correctly on their practice sheets. In addition, they may be able to identify a given fraction. They may even be able to do the bare number tasks listed above…but do any of these show a TRUE understanding of fractions and their real-world application? That takes us, as teachers, getting in trenches with them watching, listening, and asking questions. Provide students with open-ended tasks and challenges that give them time to explore, discuss, and for YOU to observe. If your math series is full of computation–that’s fine! Just WAIT to do that work until students have demonstrated readiness. 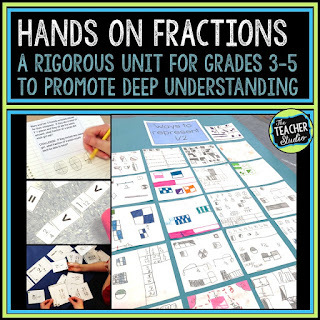 Unfortunately, many series don’t give us enough of these experiences, which is what led to the unit I created to use with my own students and many of the other fraction resources in my store. To clarify, I simply didn’t feel as though we spent enough time on the left side of the arrow. If you want to see more, here are the links to a few resources. See you soon for more fraction thinking! Want to check out the fraction unit I use? 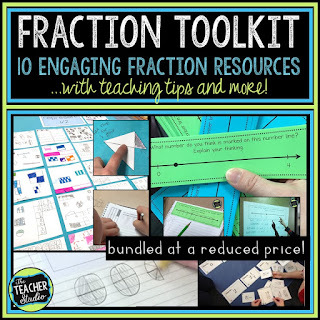 How about a bundled set of TEN fraction resources that support best practices? Do you want to pin this for later?